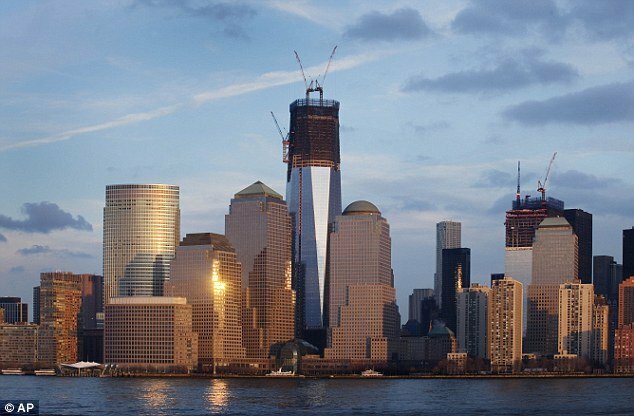 New pictures of The One World Trade Center show its frame stands at 90 storeys high, with 20 more yet to be completed. The One World Trade Center, also known as Freedom Tower, already towers above the skyscrapers surrounding the site where almost 3,000 tragically lost their lives on September 11, 2001. Workers had been adding a new floor a week up until last year, but in recent months work has slowed. The Port Authority’s executive director, Patrick Foye, blamed rainy weather and high winds at the top of the building. Patrick Foye spoke to reporters following a panel discussion on infrastructure at Fordham University on Monday. The authority also says it is having trouble finding space for the trailers that move upward with the workers. As the tower narrows, there is less space on each floor, and transferring the trailers upward takes more time. DCM Erectors, the New York-based company that is laying the steel, has also had financial problems, Patrick Foye confirmed Monday. Patrick Foye said the authority has had to step in and pay some of the company’s bills. Steel deliveries have continued, he said. DCM did not immediately return a telephone call from the Associated Press seeking comment. Patrick Foye said that One World Trade Center is 60% leased and that the authority is still aiming for a completion date in the fourth quarter of 2013. The structure will top out at 1,368ft foot height, taller than same size as the old WTC. However, the new building will have a 408ft spire, taking it to 1,776ft.